An Ayurvedic product, aimed at maintaining the health and radiance of your facial skin, Kaircin is an Ayurvedic facial oil that repairs the damaged skin, moisturizes it and slows down the signs of ageing. 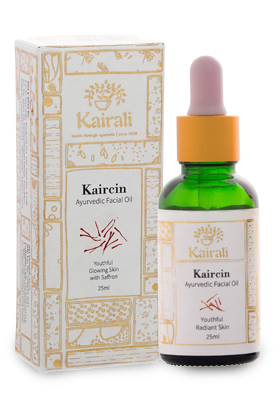 Kaircin contains saffron and lotus extracts that proves to be a wonderful Ayurvedic oil for the facial skin. Direction of use: Apply 5 drops of Oil on face and neck before sleeping in a circular motion. Retain for 30 minutes and wash off with Lukewarm water. Best results when applied daily.